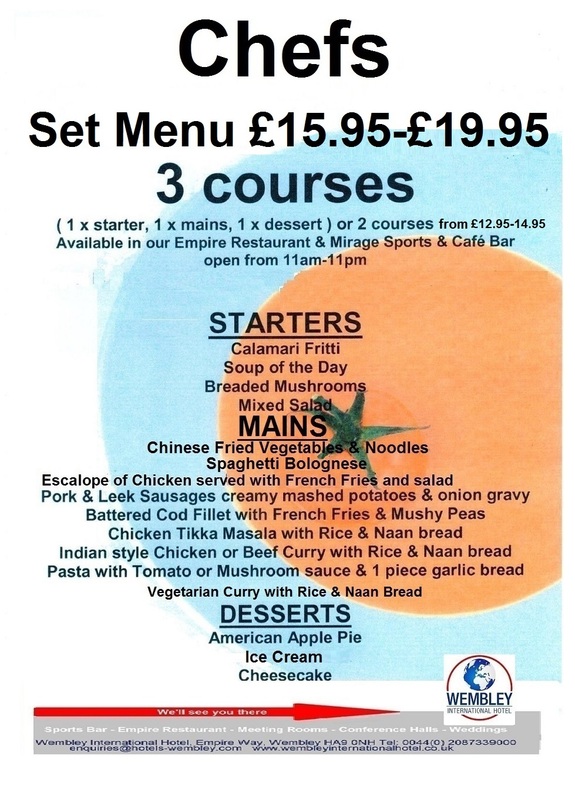 Our Wembley International Hotel restaurant Best Selling Menu – Chefs Set Menu. For Indian food Wembley we can offer our Wembley Indian banqueting menu, pre booking required. Authentic Indian cuisine freshly made at Wembley International Hotel. Banqueting hall Wembley, please see Wembley International Hotel Banqueting Menu. For the latest full Empire Wembley restaurant menu please ask at our Reception Desk or our Empire Wembley Restaurant Manager. Restaurant near Wembley Stadium. Restaurant near The SSE Arena, Wembley. Restaurant near Wembley Park Tube Station. Wembley Restaurant free parking for guests of the hotel. Our Wembley Restaurant near Troubadour Wembley Park Theatre.